Companies that use automated telephone calls that leave householders hearing nothing can now be fined up to £2m. So-called silent calls often occur when firms dial several numbers at once but then fail to have a staff member lined up to speak when a call is answered. Ofcom has fined nine businesses for making such calls, with Barclaycard receiving the biggest penalty allowed under the old rules of £50,000. Ofcom said more than 9,000 complaints were made about silent calls last year. 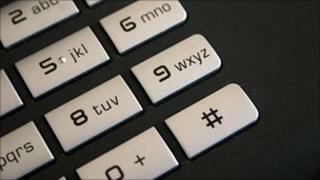 More than 70% of victims told Ofcom they received two or more calls in a day from the same company. Ofcom said it would not hesitate to impose the new £2m maximum fine, which was approved by Parliament last September. Modern call centres use automated dialling equipment to make dozens of calls at once. Ofcom said many cases of silent calls were a result of the technology used to detect answer machines failing to recognise a "live" consumer and cutting off the call before a representative of the company is connected to speak to them. Although the use of automated systems will not be banned, companies have been told to employ such practices more carefully. Ofcom said silent calls could cause "significant distress" to consumers, which could be made worse by receiving such calls repeatedly. Ofcom chief executive Ed Richards said: "Silent and abandoned calls can cause significant consumer harm. The maximum fine was raised to £50,000 in 2006.